Pingel has made quite the name for themselves with their wide variety of products. They’ve been doing it since 1967, and over the years, they’ve all but perfected the products they carry. Here at Dennis Kirk, we know a quality part when we see one. That’s why we carry so many Pingel motorcycle parts right here on our website. Pingel’s product selection is nothing if not diverse. They have a whole range of products that serve a whole range of purposes! 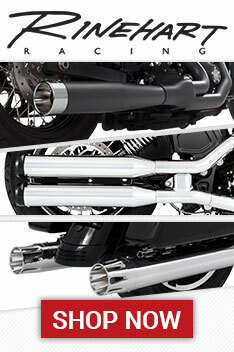 You’ll find lowering links, peg extenders, electric shift kits, and handlebar grips. One part that we think deserves special attention are their fuel valves. OEM petcocks have nothing on a Pingel fuel valve. In fact, other aftermarket options don’t either. Pingel’s fuel valves are perfect for anyone that has added aftermarket parts to their engine. After all, your engine needs more fuel, and without one these valves, your engine is going to have some serious tuning issues. Another part that we consider worth showcasing are their wheel chocks. Here at Dennis Kirk, we sell a lot of parts, which means we hear about a lot of broken ones. You would not believe how many people are breaking parts on their motorcycle because they’ve dropped their bike while it’s on the trailer or in their shop. A wheel chock is a simple solution, and it’s well worth the investment. Regardless of what part or accessory you’ve come for, we think that you’ll be happy. Pingel makes high quality parts and accessories, and whatever part you choose, we expect it will serve you well. Once you’ve found what you need, place your order! We’ll do our best to ship it the same day. If your order is over $89, it’ll even ship for free. Thank you for shopping at Dennis Kirk.